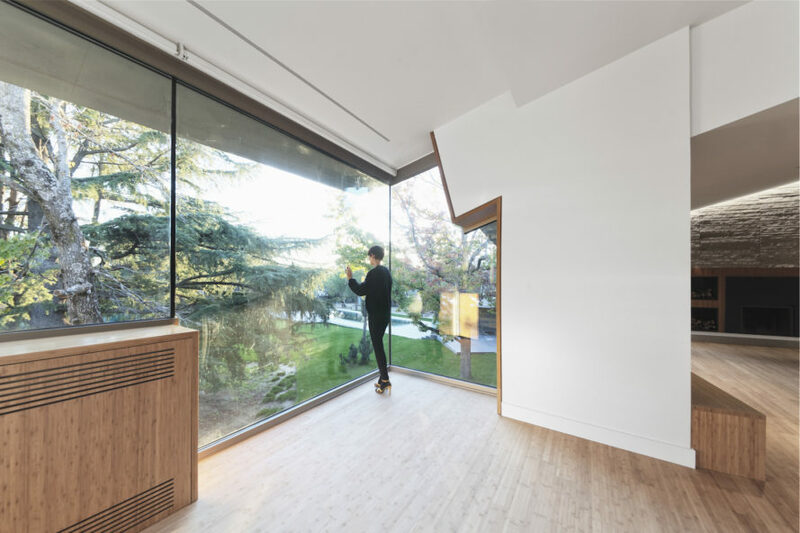 The old granite ruins of a decrepit building have been given new life and purpose in North Face, a green-roofed house in Madrid that aims for zero energy consumption. 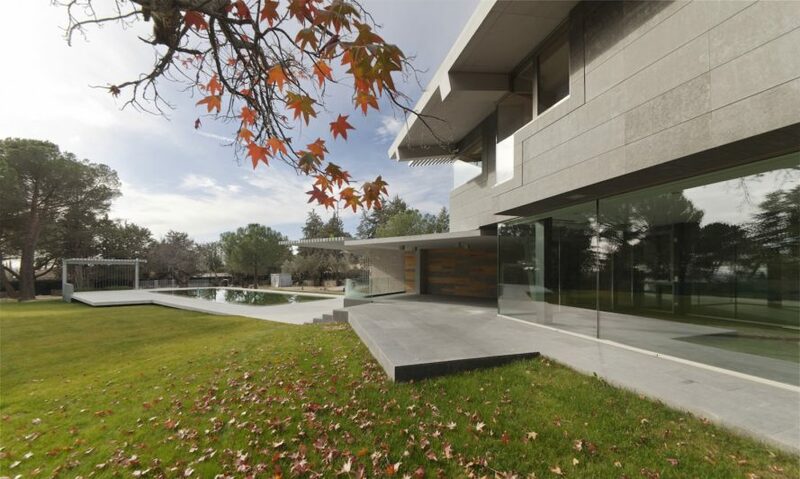 Designed by Spanish architecture firm nodo17 group, the passive solar home recycles the former building’s granite masonry into a large north-facing wall that protects the interior from cold north winds and noise. Highly efficient insulation, a solar chimney, and careful orientation of spaces help to minimize reliance on fossil fuels for heating and cooling. Though the home is named North Face after its north-facing and centrally located recycled granite wall, the house was carefully oriented to maximize southern orientation. Placed close to the property boundary, the granite wall curves away from the neighboring busy road to shelter a spacious south-facing inner courtyard planted with vines, ficus, and palms. To maximize views of the landscape—both of the inner courtyard and the surrounding environment—the building is fragmented into divided but connected housing volumes. The architects’ emphasis on south orientation for the entire home and adherence to strict guidelines minimize North Face’s energy consumption. Overhanging eaves and deciduous trees protect the home from unwanted solar gain in the summer, while allowing winter sunlight in. Strategically placed openings allow for cross ventilation. Though the home is named North Face after its north-facing and centrally located recycled granite wall, the house was carefully oriented to maximize southern orientation. Placed close to the property boundary, the granite wall curves away from the neighboring busy road to shelter a spacious south-facing inner courtyard planted with vines, ficus, and palms. To maximize views of the landscape—both of the inner courtyard and the surrounding environment—the building is fragmented into divided but connected housing volumes. The architects’ emphasis on south orientation for the entire home and adherence to strict guidelines minimize North Face’s energy consumption. Eaves and deciduous trees protect the home from unwanted solar gain in the summer, while allowing winter sunlight in. Strategically placed openings allow for cross ventilation.